This walk explores nearly 2000 years of London's history, with gardens built around Roman remains and church ruins, the gardens of city livery companies, and those made in churchyards and on bombsites after WW2. The walk starts and finishes at St Paul's underground station. It takes about two hours, and covers 2.4km, but could take longer, depending on the time spent in gardens. For a shorter walk, the route can be started or finished at Moorgate underground station, between Section 1 and Section 2. There is a variety of places to eat and drink close to St Paul's underground station, as well as at a number of other points along the way. All the gardens are open during daylight hours, unless otherwise indicated. Seating is provided in most gardens, and they are accessible to wheelchairs, except where stated. The City of London has always been a bustling centre of commerce. Today it is well known as an international financial centre, but its importance dates back to Roman times, when it was known as Londinium and was bounded by the London Wall. During the medieval period, trade associations known as livery companies played a prominent role in the City, and their influence continues to this day. During World War 2, the City suffered enormous damage - large areas were completely destroyed in the Blitz. Many of the buildings we see today are post-war, including the Barbican Estate, which is considered an important example of concrete Brutalist architecture. The original church of St Agnes and St Anne was destroyed in the Great Fire of 1666. A new church, designed by Sir Christopher Wren, was largely completed in 1681. The site suffered bomb damage in WW2, and the church was restored in keeping with Wren's design. In the 1970s the churchyard was extended and a garden created. The present garden consists of lawn and decorative trees including catalpa, false acacia, rowan and cherry. 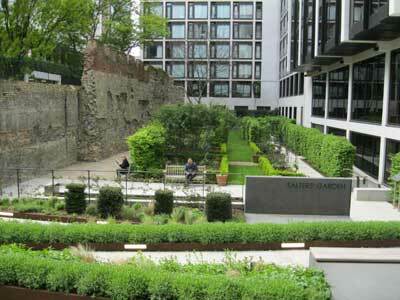 The garden is on the site of the former churchyard and church of St John Zachary, which was partly destroyed in the Great Fire. In 1339, The Worshipful Company of Goldsmiths had acquired land here and built the earliest recorded livery hall on this site. Following the destruction of part of the Company's property during WW2, in 1941, firewatchers laid out the first Goldsmiths' garden, which won Best Garden on a Blitzed Site in 1950. Anne Jennings redesigned the garden in 1995/96. The present multi-level garden includes mature trees, benches, lawn and a fountain. It relates well to the contemporary architecture of the adjoining Lloyds TSB building, which features box topiary on its terraces. Continue down Gresham Street, taking the second left on to Wood Street. Walk up Wood Street and turn right on to Love Lane. 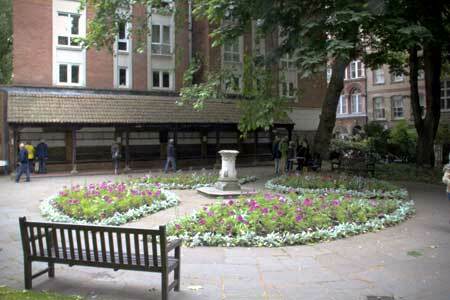 After the police station on your left is St Mary Aldermanbury Garden. (There is an accessible public toilet south on Aldermanbury). 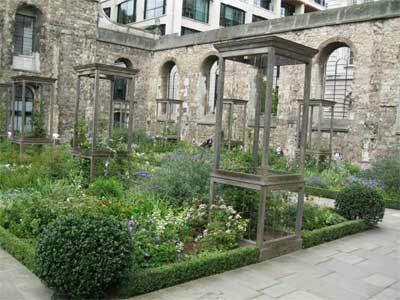 This striking garden is next to London's Guildhall, which has been the centre of City government since the Middle Ages. During the Roman period, an amphitheatre, the largest in Britannia, was located on this site (its remains may be seen in the basement of the Guildhall Art Gallery). The garden is a spacious rectangular site with interesting shrub and herbaceous planting. It contains the footings of the 1437 church of St Mary Aldermanbury, along with a large willow basket planter and a bust of Shakespeare. Benches and other sculptures make this garden a pleasant spot to sit and rest. 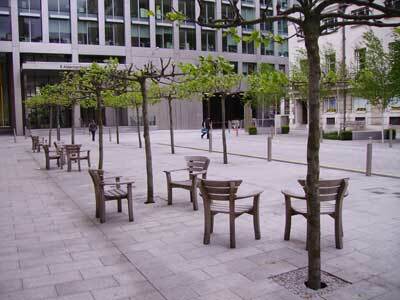 Aldermanbury Square was laid out in 1962 as part of the London Wall Plan, the extensive post-war re-planning of a 28-acre area by the Corporation of London and London County Council following significant war damage. Although it is a small oval traffic island, it is an attractive green space. It was re-landscaped for the Millennium to include a bench with an inscription of the history of the site. The garden also features a sculpture, shrub beds and a fountain. Girdlers' Hall is one of only 38 livery company halls left in the City. There has been a building on this site since 1431, but the present neo-Georgian hall was completed in 1961. Its small scale is a vivid reminder of how much the City has changed over the past few decades. 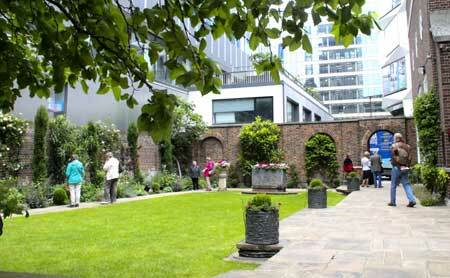 Although the Girdlers' Hall garden is modern, livery companies have maintained City gardens since the Middle Ages. This garden, which is not open to the public, includes attractive flowering shrubs and a mulberry tree. Note: the garden is currently closed because of the CrossRail works. To end the walk here, return to Moorgate underground station, on Moorgate. 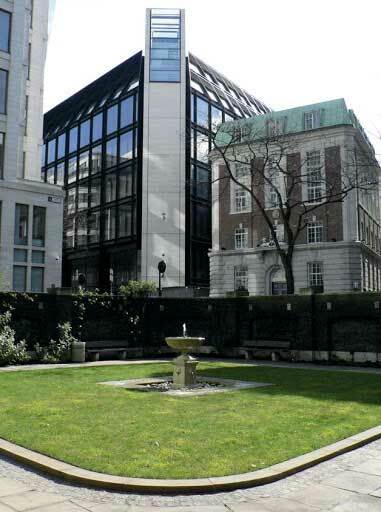 This Grade II Listed garden is, at 2,220 square metres, the largest open space in the City. It is also what remains of Moor Fields, London's first public park, dating from 1607. The present garden was originally laid out in 1815 to a design by Charles Dance the Younger. 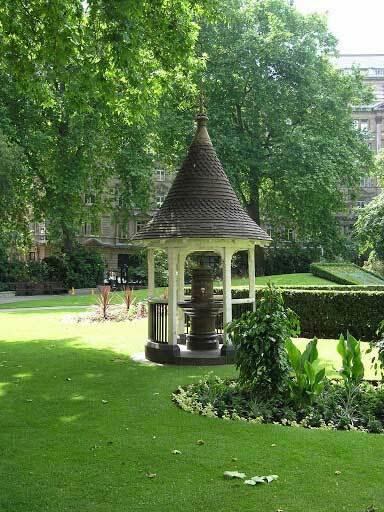 Finsbury Circus is an oval garden with an immaculate bowling green, home to the City of London Bowling Club. The garden is surrounded by elegant curved terraces containing other listed buildings, and it is known for its mature London plane trees (some over 200 years old), bedding and fine Japanese Pagoda tree, the only one in the City. There are accessible public toilets on most levels of the Barbican Centre, as well as a variety of places to eat. 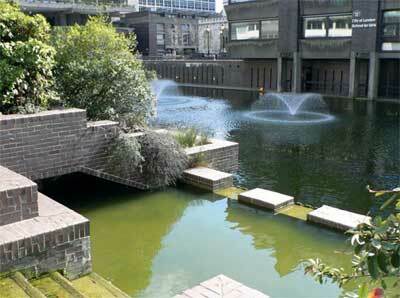 The Barbican Estate is built on some 40 acres (15.2 hectares) of land that was laid waste by WW2 bombing. Built from 1960-73, it was designed and built for city professionals and officially opened by the Queen in 1982. The dramatic architecture is the work of Chamberlain, Powell and Bon. Today it houses more than 4,000 people in 21 separate blocks. 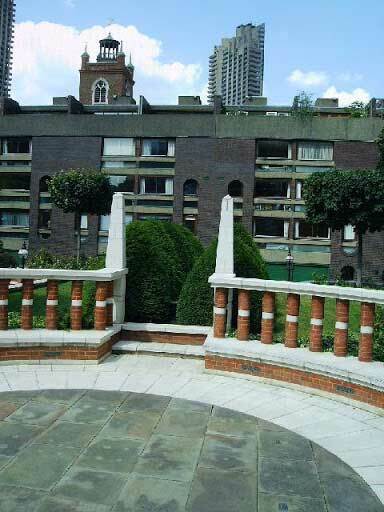 The estate is known for its many amenities including public and private gardens and the Barbican Centre. The Lakeside Gardens and Terrace are particularly impressive public spaces with waterside seating and city views. Return to the Centre through double doors by the Waterside Café and take the stairs or lift to the second floor. Follow signs for the walkway, past Osteria Bar and Restaurant, and go over Gilbert Bridge, with a view of the Lakeside Gardens. At the end of the bridge, pass between Gilbert House and Andrewes House and go down the stairs on the right, by The Postern. At the foot of the stairs, turn back on yourself, away from St Giles' Church. Pass the Wood Street Bar and Restaurant on your left to reach the corner of Wood Street and Fore Street. As of March 2017 extensive building work is taking place in this area but it is expected to reopen in the summer of 2017. 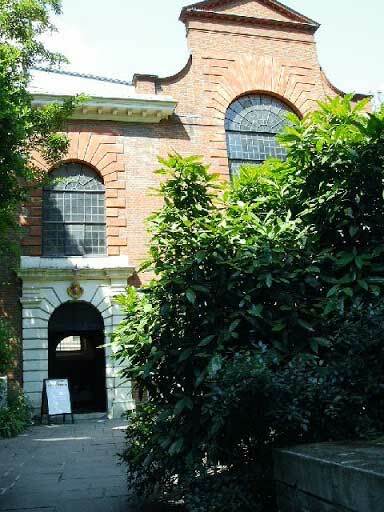 To reach Salters' Garden, proceed along Fore Street, where Salters' Hall is about 50 metres along on the right, with the garden behind it. If this is not possible, return to Wood Street and then left into St Alphage Garden or right into Monkwell Square. The garden is normally open to the public Monday to Friday 9am-5/5.30pm. It is open for Open Garden Squares Weekend. It is, however, likely to be closed for works until mid-2017. Originally opened in 1981, this contemporary garden was redesigned as a knot garden by David Hicks FRSA and reopened in 1995 to commemorate the 600th anniversary of the Worshipful Company of Salters. See www.salters.co.uk . This lovely secluded garden, which is sunk below road level and has the old Roman City Wall as its southern boundary, is formally laid out with areas of lawn, hedging, pergolas and fountains. In summer, it is full of roses. Backing directly onto Salters' Garden are St Alphage Garden and St Alphage Extension Garden. Part of the garden can only be accessed via a wooden flight of steps. (0.02km) 1.27km The garden can be reached either through a gate in the back right corner of Salters' Garden or by a street, also called St Alphage Garden, off Wood Street. As of March 2017, extensive building works are taking place, but the footway of St Alphage Garden is still closed. St Alphage church has a long history dating back to medieval times. The ruined 14th century tower is all that remains. By 1872 the former churchyard had become a small public garden, bounded on its north side by a high section of the Roman city wall (which forms the boundary with the adjacent Salters' Garden). The present garden includes flowerbeds, trees and seating, as well as a gate looking into Salters' Garden. 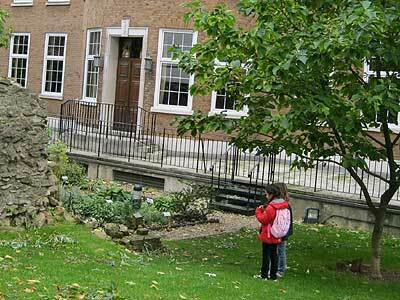 Monkwell Square was created after WW2, and there has been a garden here since the 1960s. In the 1980s, architects The Terry Farrell Partnership built Alban Gate, at which point Monkwell Square was much reduced in size and redesigned. It is now a quiet residential area in the midst of the bustling City. The landscaping features a central raised area with balustrades, an obelisk and planted areas in each corner. 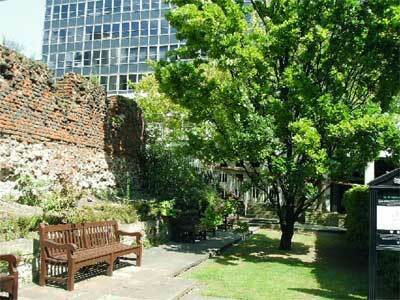 The Barber-Surgeons' Garden is one of 10 livery company gardens remaining in the City. There has been a garden on this spot since at least 1555. Its planting was influenced by herbalist John Gerrard, who was Master of the Surgeons' Company in 1607. The present garden was begun in 1987 on a derelict bomb-site. It contains the remains of a bastion of the Roman fort (c. 300 AD), along with formal planting and a larger informal area. A highlight is the Barbers' Company Herb Garden, with 45 small plots divided into four areas corresponding to different uses of herbs/medicinal plants. See www.barberscompany.org.uk. First laid out as a public garden in 1880, this small park was originally formed from the churchyard of St Botolph Aldersgate, later extended with two other adjacent churchyards, and purchased by public subscription in 1900. Its name derives from its popularity with workers from the nearby Post Office. The highlight is artist G.F. Watts' extraordinary 1899 memorial shelter with glazed plaques commemorating the heroic deeds of ordinary men, women and children who lost their lives saving others. Other features include a goldfish pond and fountain, as well as flowerbeds and a fine collection of tree ferns and other exotic species. In the Middle Ages this was the site of a Franciscan monastery and today’s garden is on the site of the Franciscan Church of Greyfriars (1225). Following the dissolution of the monasteries under Henry VIII, it was converted for use as a parish church. In 1429 Richard Whittington, Lord Mayor, founded a library here. Numerous well-known people, including four queens, were buried in the old church, which was destroyed in the Great Fire of 1666. A new church, designed by Sir Christopher Wren, was built between 1687 and 1704. The body of the Wren church was gutted by fire in 1940 during WW2 – only the west tower now stands. A major overhaul of the gardens took place in 2011, when the garden was stripped of all its planting. Major soil improvements were carried out, along with some hard landscaping improvements. The new planting design was implemented to reflect the current trend in garden planting and to increase bio-diversity. The garden, which now consists of heavily planted herbaceous borders, also includes a variety of modern repeat-flowering shrub roses and climbers. The concept, although based on ‘traditional herbaceous planting’, does also incorporate a more modern interpretation within its planting palette. The garden has a colour scheme of mainly blue, purple and white, with shots of deep crimson, silver and lime to bring it to life, all contained within low, clipped box hedging. The wooden towers within the planting, which replicate the original church towers, now house a variety of discreet bird boxes to encourage the bird population. These towers also host a variety of climbing plants. 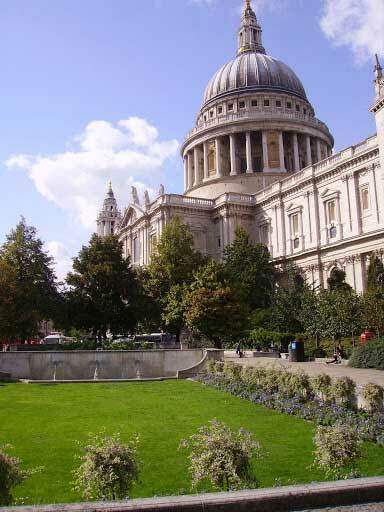 The present building is the fifth cathedral on this site, designed by Sir Christopher Wren. The first building was erected in 604 by St Ethelbert, King of Kent, the first Christian king in England. A Roman temple to Diana once stood here, and there is evidence of Roman burials. 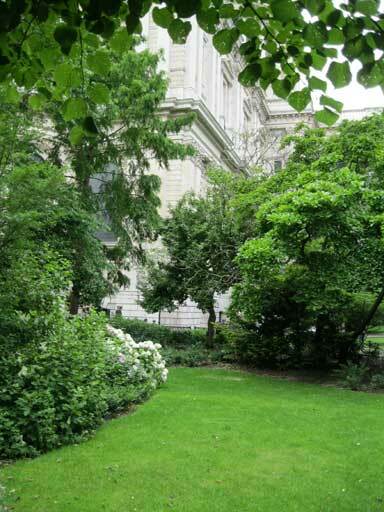 The churchyard garden is part of the precincts of St Paul's and is an important part of its setting, as well as providing valuable open space for public use. The garden was laid out in 1879 by Edward Milner, designer of private gardens and public parks. The garden includes winding footpaths, fountains, sculpture and seating, and features lawns and mature trees and shrubs, as well as a lovely rose garden. The restored 1714 churchyard railings are important early examples of cast iron work. The Festival Gardens were laid out in 1951 by Sir Albert Richardson, following the ground plan of pre-war buildings. They were the Corporation of London's contribution to the Festival of Britain. The site was formerly that of Old Change, a street dating from 1293. The formal layout consists of a sunken lawn with wall fountain, which was a gift of the Worshipful Company of Gardeners. This lawn is surrounded by a raised paved terrace with stone parapets and seating, planting in tubs and a number of trees including a pleached lime hedge and a fine catalpa. 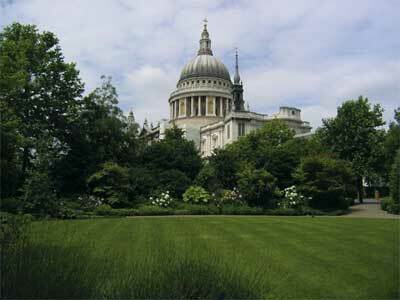 The garden offers an excellent view of St. Paul's Cathedral. In 2012 the gardens were extended towards the west into the area formerly used for coach parking. The new garden represented an enormous increase in accessible green space, boasting 378sqm of lawn, some 3,000 herbaceous plants, 184 linear metres of clipped box hedging, flowering street trees and multi-stemmed garden trees. From here, you may either return to St Paul's underground station (Central line) or continue east on Cannon Street to Mansion House underground station (District and Circle lines). This award-winning contemporary garden was designed by Elizabeth Banks Associates and completed in 2000. It is a public park in the garden square style, with an oval, slightly convex lawn surrounded by trees, shrubs and herbaceous planting. 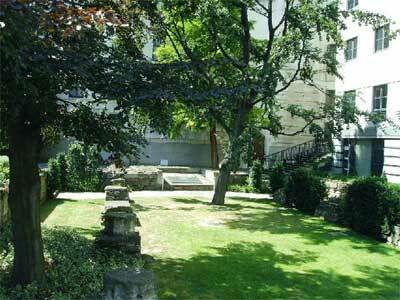 The attractive and carefully designed planting creates the feeling of a secluded garden in the midst of the City. Walk prepared by Emily Mealey and Ilene Sterns for the London Parks & Gardens Trust, 2006. Please be aware of your personal safety when walking. Walking in pairs or groups is recommended. Use designated road crossings where possible. A detailed map should be used in conjunction with this walk. Much of the historical information above comes from the London Parks & Gardens Trust's London Inventory of Historic Green Spaces, a database of over 2,300 sites. All due care has been taken to ensure the accuracy of information in this walk, which is offered in good faith. Please advise us of any changes or inaccuracies you may encounter by writing to LPGT, Duck Island Cottage, St James's Park, London SW1A 2BJ, or email us.